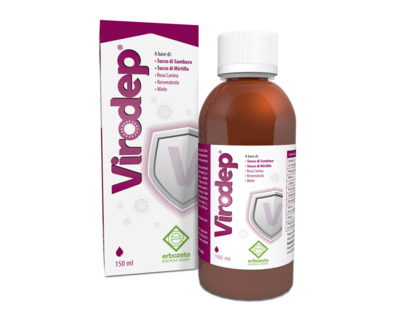 VIRODEP® is a food supplement based on Elderberry and Blueberry juice, Honey and Plant Extracts. Elderberry promotes the functionality of the upper respiratory tract and the fluidity of bronchial secretions, as well as favouring the natural body defenses. Blueberry, Dog Rose and Polygonum have an antioxidant action. Concentrated juice of Elderberry, concentrated juice of Blueberry, Honey; Dog Rose, Polygonum. GLUTEN FREE AND NATURALLY LACTOSE FREE. Take 15 ml a day, far from meals.